Enter Coupon Code: "aprilpromo5" at check-out to save 5% and also receive TWO (2) FREE Carbon Water Filters. 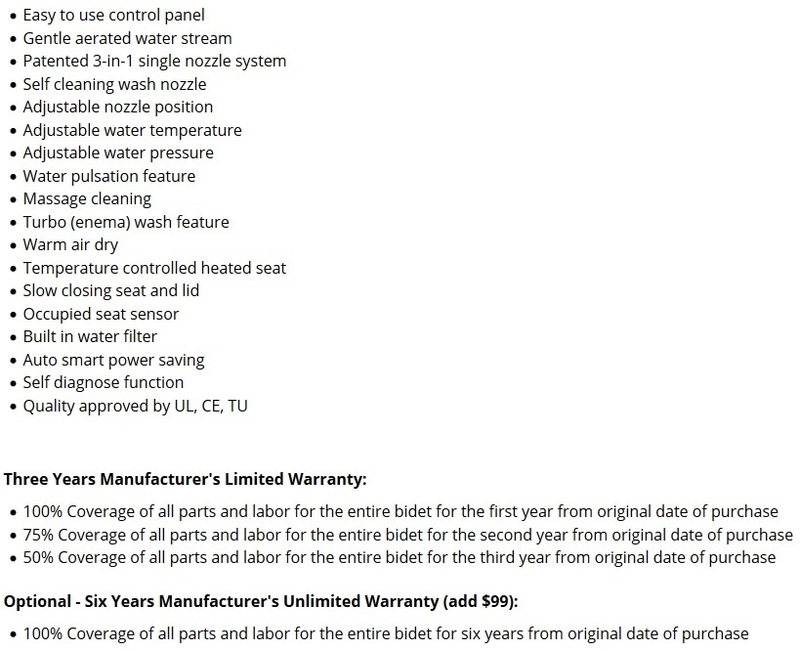 Note: The following video is our video review of the BB-1000 from Bio Bidet. It is the same as the BB-800, except the BB-1000 has a remote control while the BB-800 has the control panel attached. The Bio Bidet BB 800 is the same unit as the BB 1000 except for two differences. The first difference is that the BB 800 has the control panel attached to the side of the seat (the BB 1000 has a remote control). The second difference is this model does not have the air deodorizer feature. Other than these two differences, they are exactly the same - the same nozzle, the same body, and the same features. The BB 800 is a fully featured seat, so you can enjoy the comfort of the spa right in your own home. Equipped with both posterior and feminine wash functions, adjustable water temperature, adjustable water pressure, and adjustable wash nozzles are included. At the touch of a button you can customize your wash settings so they are just right for you. With its gentle, aerated wash it cleanses you with maximum comfort and hygiene. When done washing, use the convenient air dry feature to help with any excess moisture. You'll also find the heated toilet seat feature to be quite enjoyable. Great for the winter months, it has four different temperature settings and can be turned off during the summertime. All functions are controlled with an easy-to-use control panel that's attached right to the seat. An occupied seat sensor, slow closing seat, and power saving mode are some of the other handy features you'll find in one of our best selling models. 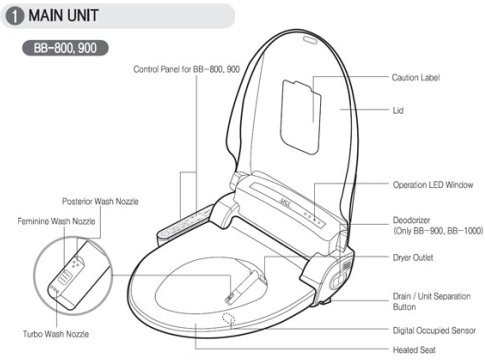 The Bio Bidet BB-800 is the same exact seat as the BB-1000 with two notable differences: the BB-1000 includes a wireless remote control and a built in-deodorizer wheras the the BB-800 does not include these features. But other than these two differences, the two models are exactly the same. As one of the best selling seats we carry, the Bio Bidet BB-800 is fully featured, offering function and features your whole family will enjoy. As for wash features, you'll find posterior wash, feminine wash, and turbo (high pressure) wash features. Settings on these wash features are adjustable too – water temperature, water pressure, and the position of the wash nozzle can all be customized to your preference. Fully loaded on non-wash features too, you'll find a temperature controlled-heated seat, soft closing seat and lid, and a warm air dry which helps with residual moisture after washing. You should also note it has one of the best air dry features of the units we reviewed. I have been using bidets for several years in other places, but I never owned one. After doing my research, I finally purchased the BB800. Installation was a breeze and having had it now for about two weeks, I am glad I made the choice I did. It is everything I hoped and I know it will give my years of use and keep me healthier and happier. I picked up my BB800 and it is great. It has most of the advanced features and was a snap to install. Overall we are very happy with the unit and my wife loves it. We are enjoying the bidet so much. If you have any issues with getting very clean because of t.p. you will be glad you spent the $. 4 stars because seat needs to be cleaned with water only most of the time. I did get the ok to use diluted vinegar occasionally. That helps a lot. I ordered 2 Bidet and I now have them installed. Very pleased with product and the details available for installing it. Kudos on the customer service which is difficult in online sales. I have MS. The disease affects my body's ability to control my bowels. I was fed up with going through an entire roll of toilet paper to get clean. I spoke w/a plumber friend who told me about bidets now included in a toilet seat. I did some research & discovered Bio Bidets. Good prices, selection & great reviews. I love this product! It exceeds expectations. Bidet is wonderful. Very easy to use and family loves it. I thought we couldn't have a bidet in our small bathroom but discovered these seats that go right on top of your toilet and it works great. Pretty sturdy seat so looks like it will last a long time... I hope so anyway! This bidet seat is a well made product. Easy to install instructions, pleasure to use and I for one am happy I got it. We love our new bidet seat! It gets you the heated seat when the house is cold. The features are great, and everything works exactly as you would expect, plus it looks very good in the bathroom. My wife like it more. I love my bio bidet so much I had to get a second one. Happy Customers! Want to buy another! Our family had never owned or used a bidet before...we were in for a treat! Although, a little awkward the very first time we soon fell in love with our seat. This seat is loaded with tons of features from a warm air dryer to a heated seat. (Which is beyond amazing on a cold Vermont morning!) The installation was quite easy. We did have to install a GFI outlet near our toilet, but otherwise it did really take just a few minutes. One of our biggest benefits with this has been with its child friendly features. I would recommend this to any families with children! It is very easy to adjust the water temperature and pressure to allow for a gentle, cleaning stream. The price for this seat is pretty incredible as well. Just a brief warning...this makes regular, US toilets seem most unpleasant! Buy it...you won't regret it! We love our new bidet seat! It gets you clean and the heated seat is heavenly when the house is cold in the early morning. The features are great, and everything works exactly as you would expect, plus it looks way cool in the bathroom. The people at BidetsPlus were very knowledgeable regarding features and installation and extremely helpful. Installation was a snap. You will not be sorry you purchased this bidet!